Wormseed is a stout aromatic plant 3-5 feet tall. Its erect stem is strongly branched from the base. Oblong or lanceolate with lacerate-pinnatifid margins, its alternate, yellowish-green leaves are marked beneath with small resinous particles. Blooming from July to September, the numerous green flowers grow on almost leafless spikes and are followed by small, green bladdery fruits with solitary, lenticular seeds. Seeds glandular-spotted. Found in waste places in almost all parts of the United States. Naturalized from Central America. 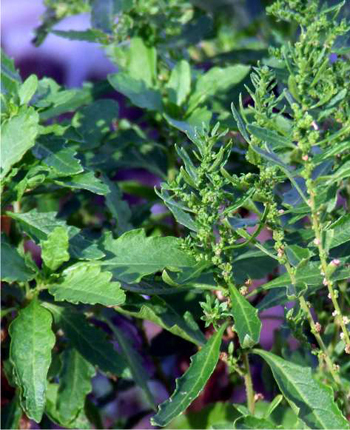 The oil of chenopodium, derived from the seeds and other overground parts of wormseed, is an excellent anthelmintic for roundworms, hookworms, dwarf tapeworms, intestinal amoeba, and other intestinal parasites, though it is not as effective against large tapeworms. Either the oil or an infusion of seeds with milk was used in treating worms in children. Now largely replaced by synthetics, wormseed is seldom used. Wormseed is also used as a mild cardiac stimulant and to promote secretions of skin and kidneys. This herb’s oil is highly toxic. A dash of the leaves is added as a culinary herb to Mexican bean dishes in the belief that it may reduce gas. May cause dermatitis, vertigo (dizziness or light-headedness) or an allergic reaction. An overdose of the oil can result in poisoning and death. (a 1 year old baby given a dose of 4 drops 3 times per day for 2 days, died and other cases of overdose deaths are on record. Do not use wormseed without medical supervision.